About a month ago I was contacted by a representative from eShakti.com to see if I was interested in doing a product review. 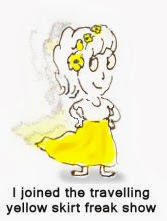 I was familiar with the company, and had seen their products reviewed by other bloggers. eShakti offers women's dresses, skirts, tops, and jackets that can be customized both in size and style. The shape of necklines can be changed, sleeves shortened or removed, and skirt lengths raised or lowered. 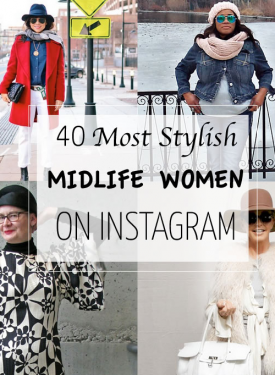 After browsing the selections that were set aside for bloggers, I was concerned I wouldn't find anything that suited my personal style. I prefer separates over dresses, and most of the items set aside for bloggers to review were dresses.....very feminine and pretty cotton dresses, in retro-inspired shapes like the sheath, and snug-fitting bodice with a full skirt. 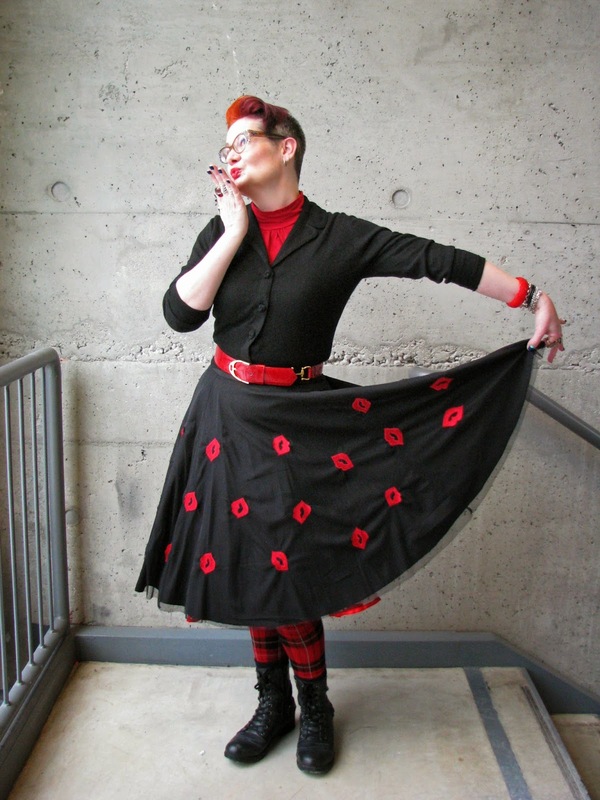 Then I saw this skirt, and I knew I'd found my match. After selecting the item I wanted to review, I entered my measurements into a form on the website, including waist, hips, and height. The skirt has a high waist with a side zip, and a removable fabric belt, and to my delight, it fit perfectly. 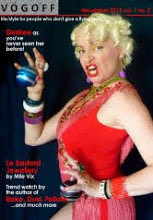 You can read about their customer service and custom sizing and styling here. 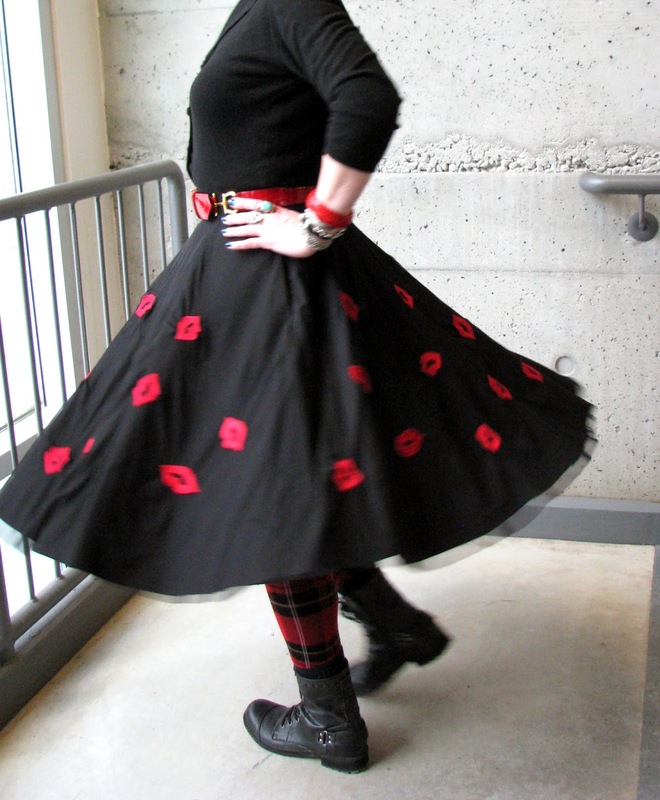 Now y'all know how I love black and red together, and this full circle skirt with its 50's shape and lip-print overlay makes a fun addition to my wardrobe. Worn with a sleeveless top or an embellished jacket, sheer stockings and heels, it would make a great "fancy party" outfit, but I chose to make it casual, with a cardigan sweater, plaid tights, and clunky boots. I decided to wear my "Madge" glasses in keeping with the retro feel of the skirt. The underskirt is a cotton/poly blend, and in the description of the skirt on the website, the sheer overlay was said to be made of tulle. In my experience, tulle has more stiffness to it than the sheer nylon fabric the overlay is actually made of. The care instructions state that the skirt can be washed by machine, but I would be concerned about whether the nylon overlay would survive. I added my trusty red crinoline underneath to add the required floofiness. The skirt has lovely deep pockets, which is always a plus for any item of clothing! 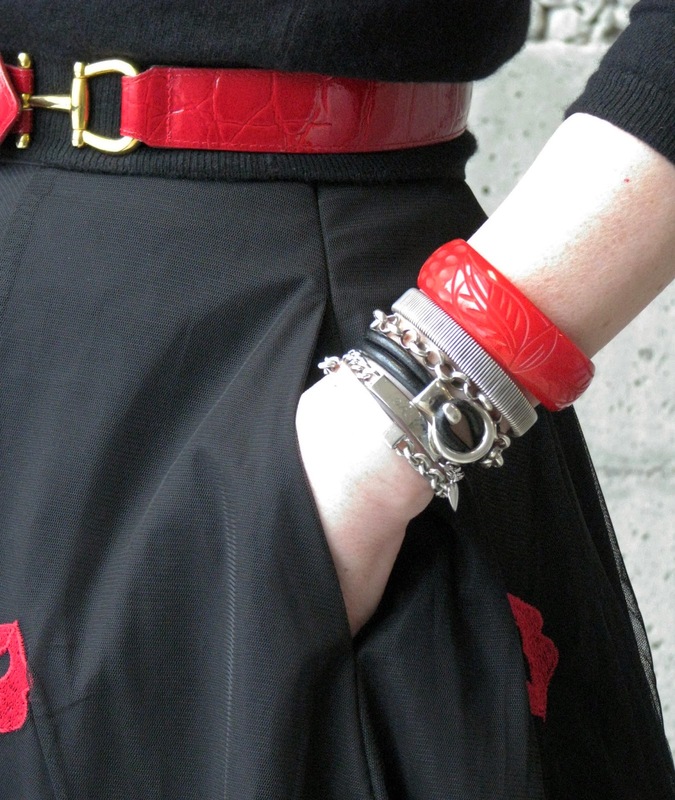 My red carved bakelite bangle matches the red of my belt and the lip-print perfectly. Overall, my experience with eShakti was a positive one. The ordering and size customization was very straightforward and the shipping efficient. Other than some disappointment about the fabric of the embroidered overlay, I was very happy with the look and the fit of my skirt, and I received dozens of compliments over the course of the day, and when I wore it to the Wearable Technology and Made Clothing Show at Museum London that night. If you have difficulty finding dresses that fit all of your body, instead of just your bust, waist, or hips, eShakti could be the solution. Enter the code 'fcfes' in the "promotional code box"to get 10% off your purchase until April 18th. What a gorgeous outfit on you! Niiiiiiiiiiiice!!!!!!!! And fuuuuuuuuuunnnnnnn! Very flattering! Great color combo and niiiiiiiice bracelets!!!!!! Lovely outfit! I've seen eShakti stuff around the blogosphere, but always had my own hesitations about actual fabrics. Gotta love the pockets, though! You totally rock in that outfit ! love that you made it "casual". 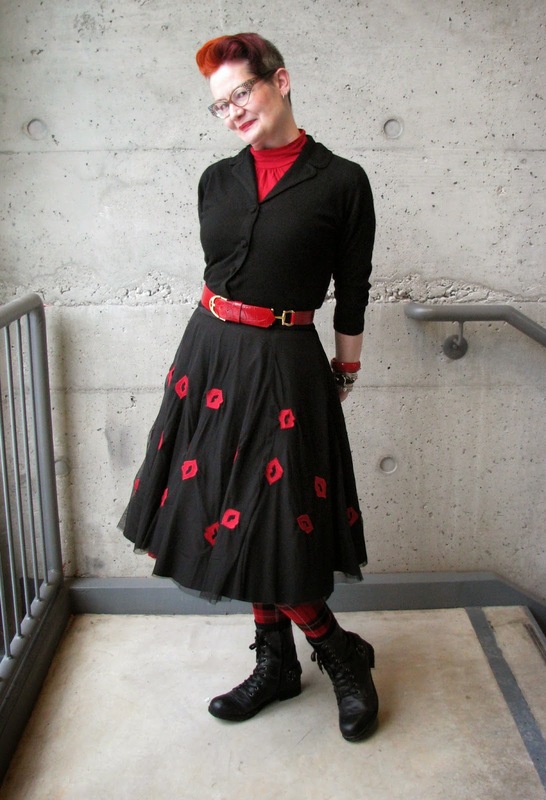 i wore black with red a lot in The 80´s, then forgot about in favor of more subtle mixes. but you inspiring me with that fab look! nice. As for washing it, I'd turn it inside out and put it in a mesh bag. You really chose the perfect item for yourself. 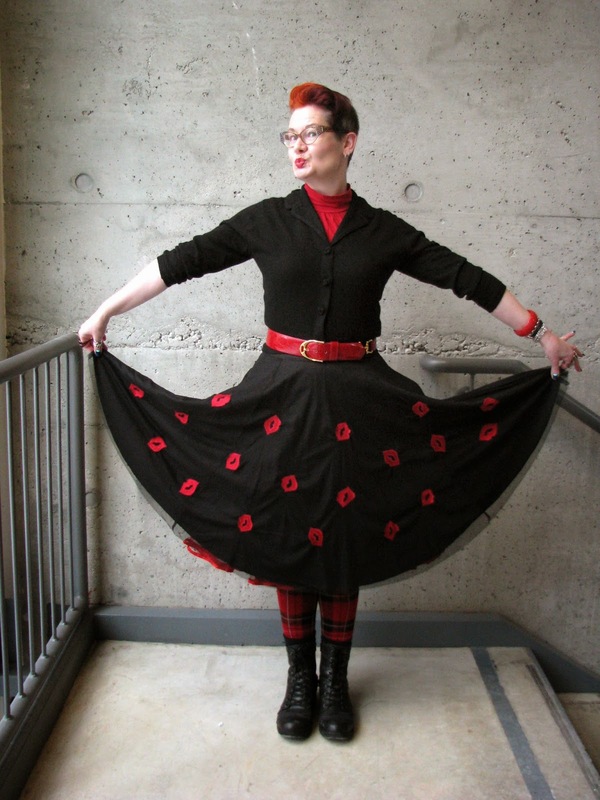 I adore the red petticoat. 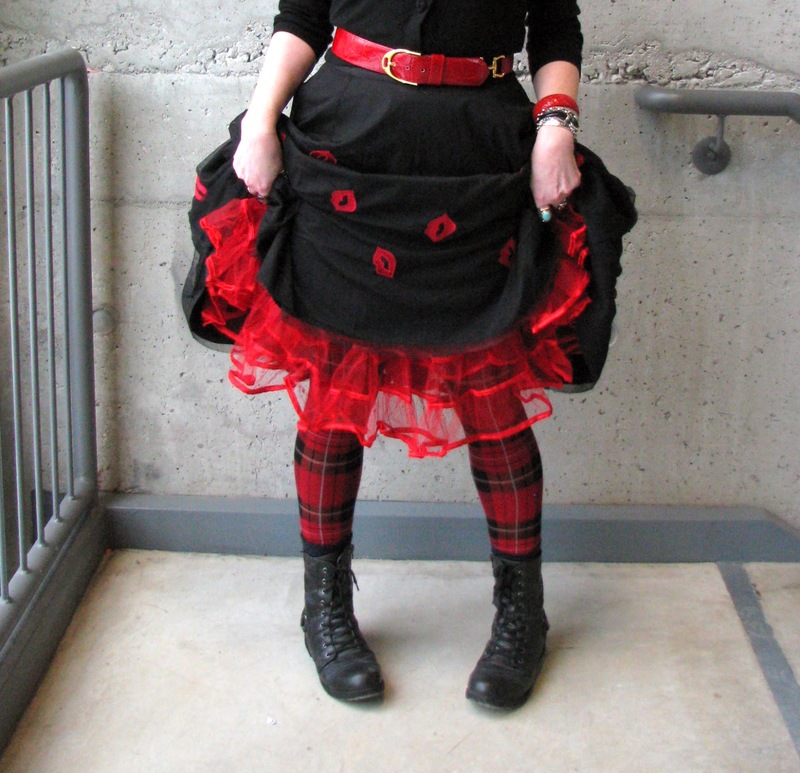 you look absolutely gorgeous, love your new skirt (and red crinoline, wouuuu), and love your tartan tights and boots and love your style and sassiness!! Yes, you know how to put the funk in Shakti alright. Fabulosity in action.